Scarecow | Wizard of Oz Cow Parade Figurines | One Price Low Flat Shipping! 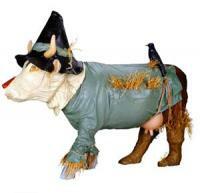 From the Cow Parade Wizard of Oz Collection, Scarecow. Designed by artist, Jeff Tackett. Made of hand-painted resin. Measures Size: 4"x 6". Featured at the CowParade Kansas City 2001 exhibit. Comes in original branded gift box. This whimsical cow is designed magnificently to look like Dorothy's Yellow Brick traveling companion, the lovable Scarecrow who thought he needed a brain. Adorned with straw and even a crow on the cow's back. Great Gift, Great Collectible!